Complex problems require fast, innovative and practical solutions. This is especially true in the sustainability field, where issues such as climate change, water scarcity, and social inequality require urgent action from individuals and organizations across the global economy. Time is running out, and ‘business as usual’ is no longer an option. Yet efforts to solve these challenges often don’t reach their full potential. Concepts, tools and frameworks are built with the best intentions, but when the time comes for implementation and use in decision-making, they struggle to get buy-in or build momentum. How can we overcome this? To ensure that solutions reach their full potential, we can place greater attention on the wider contexts and systems in which our solutions operate. 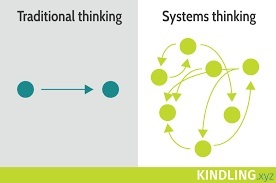 This is systems thinking, asking the question, ‘how does my individual research, idea, or solution interact with and depend on other parts of the system?’ This allows us to examine problems in their entirety and identify synergies. When faced with big, complex issues, systems thinking is key to sustainable innovation. We need it if we are to deliver practical solutions that work alongside existing infrastructure. Making innovative ideas flourish is like planting a new species - survival depends on more than a healthy seed - for example soil conditions, competing plants, water and sunlight. Systems are made up of interrelated and interdependent parts. Systems are everywhere – including social, ecological, organisational and financial. Sometimes, systems seem so ‘natural’ we don’t even realise they are there. Here’s an example of how systems thinking can work in practice. In 2016, we worked on a new project with the Generation Foundation. Our goal was to produce innovative research to support business leaders to take concrete steps towards a more sustainable version of capitalism, helping build a future where business growth contributes to positive social and environmental outcomes. There is plenty of evidence around why sustainability is important in business, so our objective was to take it to the next level by giving guidance on how to achieve it. We decided to focus our research on B Corps, a growing global business movement that unites for-profit businesses that are fundamentally dedicated to doing good. The B Corp community offers a ripe picking ground for understanding how business leaders can effect positive change in the economy. At the outset, we had lots of questions. We could have navigated ourselves straight to the people that created the movement, B Lab, asked them our questions, and stopped our project there. And while we did have very valuable engagements with the creators, we didn’t stop there. This is because we recognized the need to think about the whole system that the B Corp movement operates within. This includes a financial system that favors fast profits, a cultural system that reinforces a short-term mindset and a legal system that appears to protect shareholder return. So how did we turn complex problems into solutions? We thought carefully about the relevant parts of the system, and the diverse range of actors across it: purpose-driven entrepreneurs that are leading the way in sustainable business, investors that provide capital for these companies to grow, corporate lawyers who protect their clients from litigation risks, even academics who are researching in this field. We hosted a panel discussion to bring these diverse groups together for an honest conversation. We went to great lengths to ensure diversity in the participants to reflect the complexity of the topics at hand. By inviting diverse people and perspectives from across the system, we sparked conversations that went to the root of the problems that the B Corp movement is trying to address. This led to valuable discussions on many topics, including modern business culture, pressures on executive teams, methods of attracting investment for growth, and the nuances of corporate law. By adopting a systems approach, we provided a space for meaningful discussions and lively debates, a welcome change from the all-too-familiar scenario where panels agree and repeat similar points in different words. As a result, we heard new perspectives and the dialogue moved forward. Our participants learned something new to take away, and we found our research angle. The parts in the system aligned. So next time you are faced with a challenge, take a step back, and remember this mindset. Are you seeing the whole system? If not, how can you enable yourself and your team to do so? In addition to shifting conversations forward, our research on B Corps led to the publication, ‘The Value of Corporate Purpose’. You can read the paper here.